WASHINGTON, DC – Tempus has been named the Top G10 Currencies Forecaster for Q3 2018, according to the Bloomberg Foreign Exchange (FX) Forecast Accuracy Rankings that were released October 2, 2018. The FX and international payment solutions company has earned this top spot for three out of the last seven quarters. Additionally, Tempus has ranked second top currency forecaster for the Canadian dollar , the Australian dollar and the New Zealand dollar for the third quarter of 2018. Bloomberg FX forecasters are ranked based on three criteria: margin of error, timing, and directional accuracy. 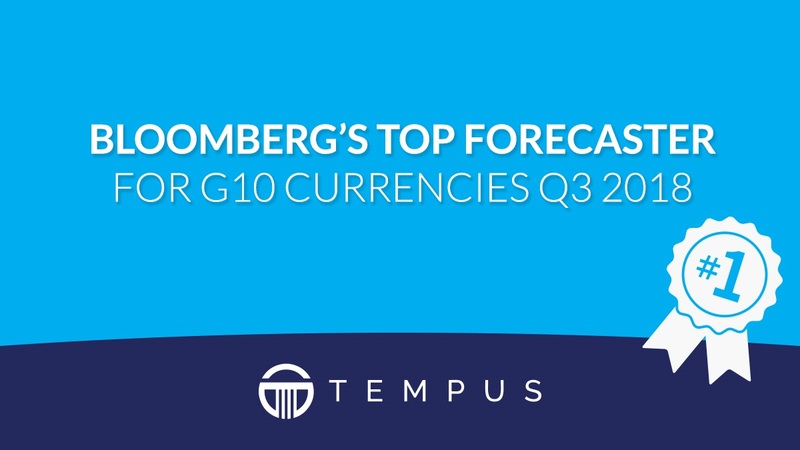 Tempus is proud to have been awarded #1 Overall Accuracy Forecaster for G10 Currencies multiple times by Bloomberg. About Tempus: Since 1999, Tempus has provided corporate clients with the best foreign exchange and international payment solutions in the industry. We operate in the US as Tempus and in the UK as Monex Europe, all part of the global Monex group, one of the world’s largest commercial foreign exchange providers. Based in Washington, DC, and together with its global affiliates, Tempus has leveraged a combined annual FX volume over $150 billion to help more than 40,000 clients from a broad range of industries successfully navigate the global currency markets and market fluctuations. As FX experts, we work with members in managing their costs, planning against FX volatility and guaranteeing profits. Whether you buy or sell currency on spot or forward rates, we tailor the best process and solution for your company’s needs. For further insight on the FX market trends, check out our Monthly Currency Outlook here.